In case you have been living in a cave, OWS is Occupy Wall Street: a protest movement that arose from an initial call by AdBusters,Â and is now a world-wide affair with “occupations” springing up in cities across the USA and the rest of the world. 1. Choose a method — occupation — that overcomes the customary weakness of other actions of the powerless such as rallies and marches: politicians, administrators, the police, simply wait them out; let the protestors have their day with marching and speeches, after which the powerful can return to business as usual. 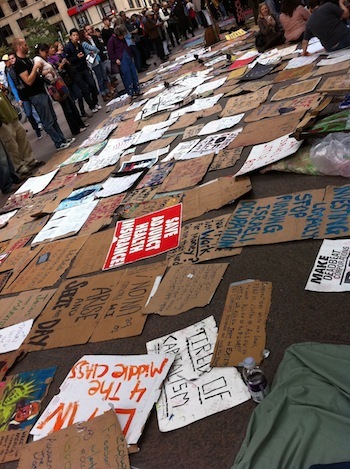 Even the term “occupy” upends that relationship. 2. Target the clearest representation (Wall Street)Â of the few who were the primary cause of the economic meltdown of 2008, while also the greatest beneficiaries of the government response to the crisis. 3. Make the identification clear: the most common slogan used by the group is “we are the 99%“. While their sentiments may not be shared by all of the 90+% that took the bulk of the pain and gained little benefit from the Bush-Obama bailouts and half-hearted programs, the material reality is well captured by the slogan. A long overdue challenge, in simple terms, to the Right’s effortless claim to the majority opinion or position. [T]he language of occupying occupy wall street that I am using suggests that any attempt to hegemonize the space will be a problem for the ‘movement.’ That is, to remain the movement it is (18 days in), it has to resist any and all efforts to channel the message. But that then implies not that the priority is a contestation among people to forge a way ahead but instead that openness and indeterminacy are themselves the goal, that which is to be protected. If that’s the case, then there is something wrong, a kind of built in (self-deceiving?) confusion: the goal is just to keep the occupation going, not to use the occupation to overthrow capitalism or bring down the banks, or redistribute wealth at all. In fact, it’s probably wrong for me to call this confused or self-deceiving: it’s explicit in a number of different statements about democracy and discussion and raising questions. This language is a language of process rather than ends. Or, the process is the end. To the extent that this is the goal, rather than a means of overthrowing capitalism and working toward putting in place a communist solution, then that’s not my revolution. There is a lot going on in this single paragraph, almost all of which is troublesome. To begin with, Dean gives away the strawman quite explicitly in her very first sentence, with the Â accurate qualifier that “the language of occupying occupy wall street” is one that she is using i.e., this is her take on it, and if her take or language leads to some “confusion” or “self-deception” it is not clear who else is to blame here! And what exactly is a “language of process“, or a “language of ends“? I am pretty sure I don’t know. What is clear however is that Dean wants to lay down the terms on which she will consider Occupy Wall Street “her” revolution: the movement has to share her goal, without question, of a communist solution. Well, okay, that’s her call to make. Why we worry? The trouble I have with Dean’s post is the way she goes about making her point, using all sorts of bad faith hypotheticals, logical leaps, and by playing games with the meaning of words like “process” and “goal”. To the extent that Occupy Wall Street remains open to and for multiple political persuasions, it is not a left movement at all. Â […] As I understand it, Ron Paul supports an odd notion of free markets; he thinks that individuals make better decisions than groups and that a social safety net damages freedom. If there is space for this view in Occupy Wall Street, then that’s not my revolution. In fact, it seems like a version of the one that hijacked the country in the 70s. What is “space for this view“, per Dean, and how do the protestors please Dean by purging the movement of such space? Should they chase away Paul leafletters hovering around the periphery? Should they not Â listen to them should Paulites attempt to start a discussion? Dean’s own hypothetical extent to which OWS is “open” to alternate “persuasions” or provides “a space” for them, is evidence (“it seems“) that OWS is out to hijack the country. In this analysis, it’s a direct route from hypotheticals (“to the extent that“, “if there is space“) to conclusions. Another example is the first section quoted above, where Dean condenses all the varied procedures, activities, slogans and positions of OWS to a matter of obsession with “process“. Out of the Brownian flurry of hypotheses bouncing around in her own mind, Dean builds a caricature of a movement — not a movement that is occupying a space to achieve goals (explicitly stated in their statements and placards); not a movement trying to avoid co-option by staying open (while also guarded) to ideas and arguments; but really rather a movement in love with its on machinations and minutiae. What do we make of the Â analysis that people have occupied a park for the fun of the process of being open to Ron Paulites and for the thrill of continuing such occupation into the balmy days of winter, rather than the more probable case that they are using the occupation as a base for protests whose goals are made explicit in their slogans? What could the author possibly mean? The easiest rough initial cut is between those who begin with an emphasis on equality and those who begin with an emphasis on freedom; another crude cut would distinguish between those who begin from an emphasis on individualism and those who begin from an emphasis on collectivity, solidarity, and a commons. For those of us who think of ourselves as communists, Leninists, Trotskyists, Maoists, and socialists, our challenge is finding ways to work within and together with the movement, which can well mean not pushing too quickly for something for which the proper support has not yet been built. There go my people. I must run and catch up with them because I am their leader. there’s a really interesting analysis of the positioning of the writer/speaker as outside OWS at this blog, permanent crisis. It’s written from an anarchist-sympathetic perspective and the “open letters to OWS” that the author examines are speaking to OWS, not to “us” as Dean does. Nonetheless, I think you can make the case that, although they are writing *to* OWS, they are also writing to each other, to “us” who are outside. I mean, it’s propaganda or, in some cases polemics (tho the writer pretends to friendliness but uses ad hominem and logical fallacy as “polite” ways of pretending friendliness while really engaging in a kind of “trashing”).